The sight of the tricolor unfurling before the victorious hero is one that has characterised many a Bollywood movie. And yet, very few manage to evoke genuine emotion even after resorting to lofty dialogue and (ear-shattering) patriotic background music. But in Raja Krishna Menon’s “Airlift”, that moment is beautifully captured. Our hero, bedraggled and exhausted after a dangerous journey, emerges into the dappled sunlight, spots his country’s flag, and feels a sense of relief that is beyond words. Menon and his lead actor Akshay Kumar resist the temptation to embellish the moment. That restraint characterises the film, based mostly on true events leading up to the largest civil evacuation in history. Around 170,000 Indians were airlifted out of Kuwait days after Iraq attacked the country in 1990. Kumar plays fictional character Ranjit Katyal, an Indian businessman who made his fortune in Kuwait and adopted it as his home country. Within the first five minutes, the film has established his contempt for India, and his ruthlessness when it comes to dealing with business adversaries. This sets him up perfectly for the redemption that comes in the end, Oskar Schindler style. Much like the sentiment of Air Supply’s hit “Making love out of nothing at all”, Raja Krishna Menon’s “Airlift” is an attempt to make a compelling movie out of nothing much in terms of action or drama as the real events during the Gulf War essentially involved weeks of negotiations and international diplomacy. 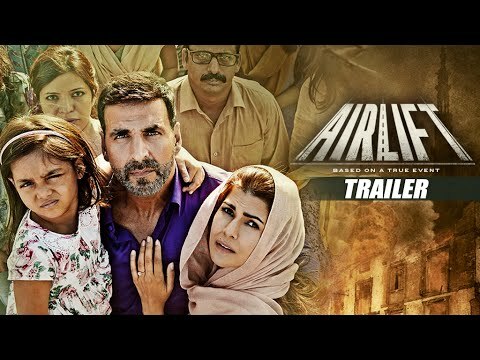 But “Airlift” manages to hold your attention throughout its two-hour runtime. A picture shows actual evacuation of Indian citizens from Kuwait. Menon inserts the right dose of wry humour and a few shocks along the way to build his film up gradually, hitting the right buttons for most of the time. But “Airlift” has its own set of flaws. Menon glosses over a lot of technicalities, like how Indian bureaucracy works, for instance. There is the mandatory and out-of-place Akshay Kumar fight sequence, and a couple of predictable story lines. Inaamulhaq plays an evil Iraqi general and looks as if he walked in straight from the sets of Borat. Nimrat Kaur as Katyal’s wife is sporadically effective, while Prakash Belawadi as a cantankerous fellow camper stands out. But the film belongs to Akshay Kumar. He is in almost every scene and this is an author-backed role that he obviously relishes. Even if you aren’t the patriotic sort, his performance is reason enough to watch the film.